In a corner of the world rests Aurina Valley, where the quietest ringing of a church bell or the faintest timbre of a cowbell are muffled by the soft blanket of snow. Best enter Aurina Valley on foot so as not to disturb the delicate balance of quiet and solitude the residents keep in this mountain community. 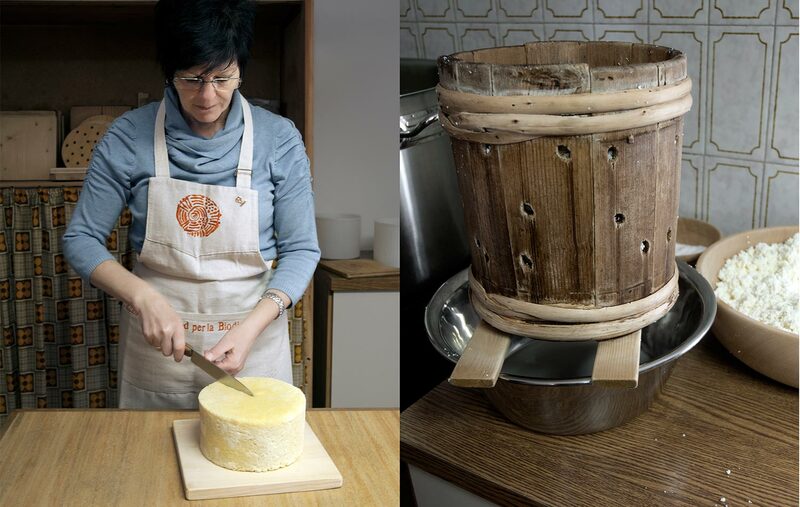 Anna uses the milk produced at the mountain farmhouse, called a maso, of Selva dei Molini to make cheese. Making cheese for her is, in fact, a self-taught art. “If I had taken a course, I would have thrown out several rules,” she jokes, sitting next to her son Karl. Karl has inherited his mother’s skill, even though he cannot pronounce the Italian word for cheese, “formaggio,” without a rather French accent that marks the regional dialect. 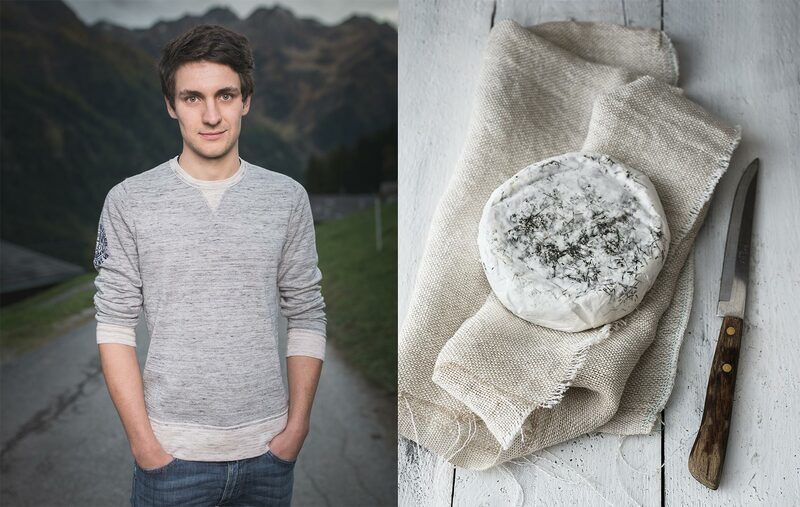 The cheeses of Anna and Karl express all the richness of the Alpine forages and the blissful content of cattle that live in the cleanest stalls in the world. The inhabitants of this daily-swept barn attest to their optimal conditions simply by their overall sense of wellbeing. The dominant tasting note in the cheeses is a round fatness, enriched in several cases with chestnuts or hazelnuts. If the Selva dei Mulini already seems to be high in the mountains, during the summer the cattle climb to what would be dizzying heights for us to feed on the high Alpine vegetation. The scent of Michael’s Alpine “camambert” is practically dizzying itself; he ages the cheeses in the bark of fir trees or larch needles. At twenty-one years old, Michael has a diploma in agriculture and is a qualified dairy expert, the latter earned in Austria. He works alongside his parents, who – up until 2001 – limited themselves to giving the milk they produced from their stupendous brown Alpine cattle to the community dairy. In 2001, that changed: they decided to give their work more value. They began to make cheese using a basic, simple recipe and a variation of spices. Young Michael, the eldest sibling of five, saw the opportunity to experiment and expand. He left his home to study for this very purpose, and returned to Selva with new, clear ideas. His parents let him observe, criticize, and give advice. Michael’s biggest satisfactions are when his parents taste one of his new cheeses, and when he finds his cheese being sold in a far-away store. As for his future, he dreams of an even larger dairy where he will have the possibility to experiment more. He also plans to begin using goat’s milk. In this world ringing with the sounds of bleating and bells, another young cheesemaker enters the scene: his name is Helmut. Helmut’s smile evokes that of the cartoon-animated Peter, Heidi’s friend in the old show Heidi, Girl of the Alps. In the traditional male-centered roles of mountain houses, Helmut has always known that both it and the cattle would be passed on to him, even if he had two other sisters. It was expected of him to become a carpenter. While he does do some woodwork, today his passion is all for the family mountain house. In 2006, he ended cattle breeding in favor of goats, and today he lives in quiet solitude with only the music of the goat bells to keep him company. 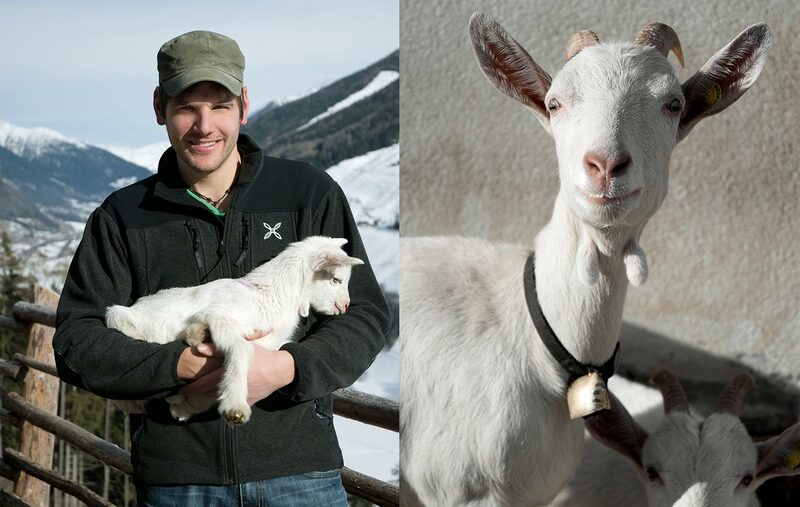 These blue-eyed, white goats – about 80 of them – give him milk that he uses to make aged goat’s cheese, intense and balanced at the same time. Before leaving the Aurina Valley, we also met the makers of Graukäse cheese: Marta, a polite lady dressed in a blue cloud, who must renounce the commercialization of her product if she wishes to remain traditional. Her Graukäse, which is grated on top of pasta when aged and spread on dark, whole-grain bread when fresh, has a pleasant acidity. This cheese knows no humiliation of plastic, but only the vitality of the wooden tub worn from generations of use. The tub was traditionally brushed off under cold, running water. It guaranteed cleanliness, but at the same time left a sufficient amount of bacteria to survive, necessary to catalyze fermentation of the milk. New law requirements, however, require the use of plastic tubs, which can be washed with soaps and detergents; unfortunately, the result is that the bacteria dies. To start fermentation, Marta would have to use chemical agents. To this, she says, “No, thanks,” and maintains ancestral tradition with the wooden tub. Technically, Graukäse is not really a cheese, as the milk is not curdled with rennet, simply fermented; and the wooden tub is less a tool than it is an ingredient. The same goes for the butter that Marta also makes, which she sculpts into wooden molds with flower and heart imprints. The preparation of Graukäse, which literally means “grey cheese” (though it is more yellowish than grey, with a white interior when fresh), is followed by the women here; higher in the Alps, it is prepared by the men. Graukäse is a small piece of her people’s heritage that Marta tenaciously preserves. The memory of the clean stalls in Aurina Valley leaves an indelible impression of stalls so well taken care of, one could sit on the floor and serve tea and cookies. These animals display their well-being in the form of their milk: it is rich in pastoral aromas and flavors. Under the knowing hands of Anna, Michael, Helmut, and Marta, this golden age that is lost to many other places is kept alive through their cheeses and their communication. And at no other time do they enjoy such a receptive audience than they do during the Käsefestival, the Aurina Valley Cheese Festival. 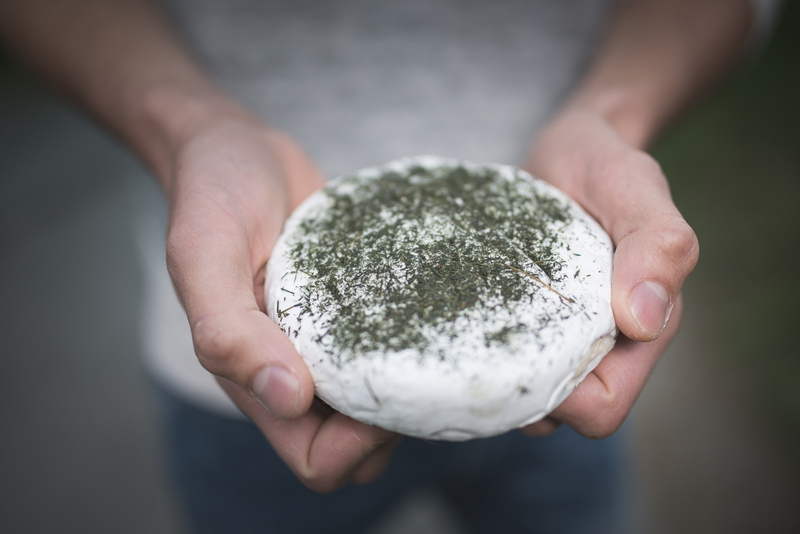 The festival was founded and is organized by Martin Pirchler, a passionate Slow Food member who has made it his mission to share the extraordinary quality of these artisanal cheeses to the rest of the world.